Leigh Bodin joins to chat about her Fitness and Nutrition business. She shares her journey to the South of France and how she set about studying for her Level 2 nutrition coach. Dedicated to learning she spent one year studying with precision nutrition for the master coaching class, based on coaching psychology. 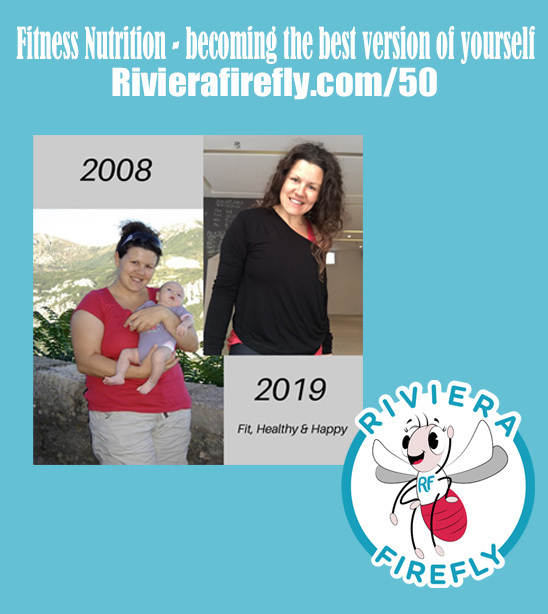 Now she is a personal trainer and nutritionist to people in their 40s, and 50s here on the Cote d’Azur. She pivots and niched down her business in 2018 and is ready to embrace the challenges and the online world of health and sport in 2019. Exercises for menopause and peri-menopause how it changes. How she created a community who are like minded to their health and fitness. Growth is her word for the year. For busy working Moms to add movement to their week: I think the more important question here is that when you are short on time, there are a few things that need to be addressed. We want more movement and we need to consistently get that movement. I could give you a list of a 100 ways to move more, but unless you have a good system in place, you are probably are not likely to do them anyway. So before we even get to the movement part think about this: I could say, Antonia, here is the best fitness plan in the world – if you follow this, you will reach your goals. But if I’ve Given you something that you don’t enjoy doing, you won’t stick with it. Whatever movement we are going to incorporate, it has be something that you will do consistently. Consistency is the magic word. So how to get a stage where we can be more consistent with our fitness and our movement? So for me , the first step is: Find out what you like to do What really ticks your box? What do you really enjoy doing? Walking, running, boxing, kettlebells, Pilates, yoga…etc. What am I going to get really excited about doing every week? And of course it that might change over time, too. This can be really fun…this can mean going out and trying new and discovering new things. You never know until you try. I hear this with kettlebells all the time. Get out there, get out of your comfort zone and try something new. 2. Decide why you want to do something – that way it becomes more meaningful. Last week, on the FB group we looked at Why, What, How…overall, we are looking for consistency. 10 mins every day is more beneficial that a big exercise session once every two weeks. We are looking for progress, a little more, a little better. Why do you want more movement in your life? What is your goal? Narrow it down and get more specific. It will help you stay motivated to get that extra movement it. Are you trying to lose fat or gain strength or change your health markers? I have a client whose goal is to be able to run around a football pitch with his son. Every has their WHY. And knowing that will help you keep moving towards your goal. Without a goal we are all kind of floating…and when you float, you are far less likely to stay consistent. 3. Work your 3’s: Structure, Systems, and Scheduling: You’ve probably heard this in business coaching and the same can be applied to health and fitness. Structure: these are things and environments that surround us. The things that we put into place to get things done. So for movement, it might be choosing a gym or a class that is close to where we live, so its easy and convenient. Systems: These are processes and practices we use to make things happen. This can include an evening ritual of getting our gym bag ready the night before, or with nutrition, prepping our food for the next day. It’s putting things in place so it makes it easier for us to do the things we’ve set out to do. Scheduling: This is probably the most important one for busy people. We don’t wait for inspiration to strike to go out and get that movement…we schedule it in like we do any other appointment and we keep that appointment. You don’t wait to you feel like going to the dentist to make an appointment. You book it. Fitness and movement – it’s self-care. So we book that time in for ourselves because it is absolutely necessary. We book our fitness and nutrition like any other appointment…and you keep it. Keep that commitment to yourself. This episode was brought to you by KidooLand The Little English School on the French Riviera. KidooLand was established in 2007 and opened new holiday locations in Valbonne in 2014. In 2018 we expanded and opened The Loft a great addition to the annexe great for birthday parties and events. KidooLand is the place to come when you have just Landed in the Alpes Maritimes. A club, a centre, a place to hang out and get all the essential information to living the dream in the South of France. Day to day we run weekly activities and classes and in the holidays fun camps for children. We even have pop up workshops and activities for adults. You don’t need to have kids to enjoy what we offer. Mum/Dad and Baby/Toddler groups, Playgroup, Kindergarten, English lessons, Adult sessions Yoga, Pilates and English and French conversation classes. Pop up workshops include stunning floral displays, colour and image consulting, painting classes, cooking, baby massage and more! We also know lots about the local schools, the international sections and bilingual programmes.